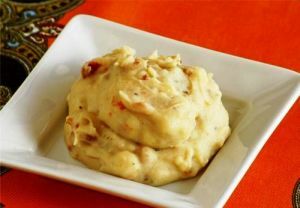 Potato Mousseline is a Dutch food recipe creamed with celery root. Bring the celery root with the milk to the boil. Let it cook for about 20 minutes then take the celery root out and mash it using a blender. Bring a large pan with salted water to the boil and cook the potatoes about 20 minutes. Take them out and make a smooth puree by adding the butter and some of the remaining milk. Mix with the mashed celery root using a spatula. Add some ground nutmeg and season with salt and pepper.